Occasionally, we come across the bones of an animal carcass in the veld and our curiosity leads us to wonder what might have happened to it and the circumstances leading to its demise. Elephants are no exception and there is often talk of "elephant graveyards" and how elephants react when one of their number dies. Here, I've imagined what the scene would look like when a single elephant, once a powerful and valuable member of the community, is in distress. 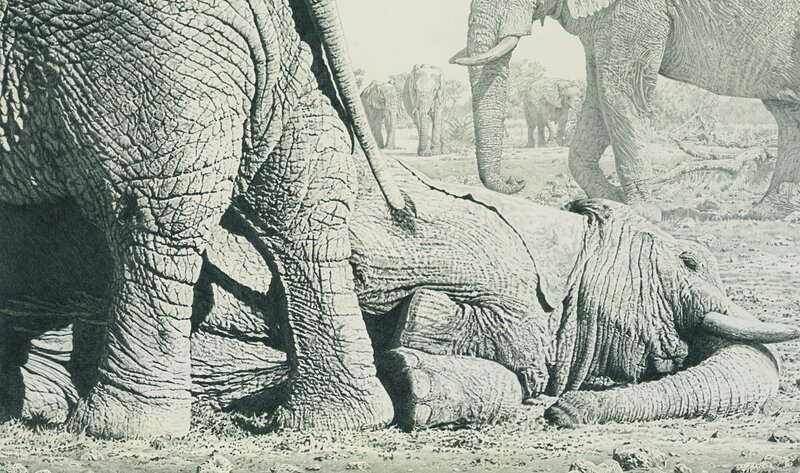 Herd members will gather anxiously around their fallen comrade and sometimes try with trunk and tusks to help the animal to it's feet, but this elephant is in poor health and weakened condition, and unable to get up from the ground and usually at this point, the end is near.